Highrise: How do I add a tag? Can I tag multiple contacts at once? Tags allow you to organize and group contacts around keywords that make sense to you. For example, you could add a tag called “Lead” and then tag everyone who’s a lead as “Lead”. Clicking on the Lead tag would then list everyone who has been tagged Lead. Other tag examples include “Vendor” or “Press” or “Client” or “Inactive” or whatever else you’d like. Filter by one or more tag to find the exact contacts you want. 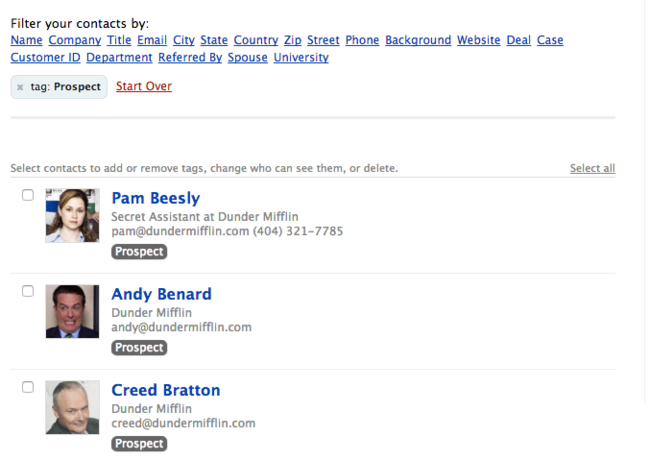 This is an example of filtering by the “Prospect” tag. You can also add a tag to a contact when you forward an email to the Highrise Dropbox. Just add “/tag [tag name]” to the top of the email. How do I filter by contacts without tags?